With the `Asian Century' now upon us, bringing with it many profound economic and political changes to the world order, it is very timely to assess the state of democracy in the Asian region. Focusing on Eastern Asia, this book provides such a review, highlighting lines of connections between the states and peoples of this complex and dynamic region. 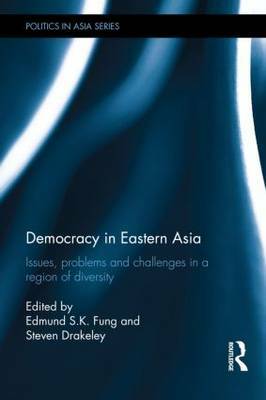 Featuring chapters on China, Japan, Taiwan, South Korea, Hong Kong, Indonesia, Malaysia, Singapore, Thailand, the Philippines, Cambodia, and Myanmar, this book provides a detailed analysis of the state of democracy in each country or territory, and shows how each is different and distinctive, whilst simultaneously drawing out important similarities. Further, it provides up to date analysis of political changes in the region relating to the processes of democratization, and, in some cases, to the ongoing quest for democracy. Critically examining the current state of political development in the region, the chapters explore the issues and problems that challenge the region's governments in terms of democratic transition, democratic consolidation, democratic improvement and good governance. With contributions from leading international scholars, this book will be of great interest to students and scholars interested in Asian politics, and politics and democratization studies more broadly.